Considering artificial turf for your garden area, but need a few questions answering before you make your decision? We run through some of the most common queries around natural turf to help you decide if it’s right for you. What are the benefits of natural turf over artificial turf? Over recent months, artificial turf has seen a rise in popularity due to its low-maintenance and all-weather benefits. So what are the benefits of a natural lawn? Unlike artificial turf, a natural lawn is living plant-life, which will oxygenate your lawn and has the potential to provide an increased air quality. For those with green fingers, a natural lawn also lends itself to integration with other plant life, such as trees, shrubberies, plants and flowers which can root within the soil. 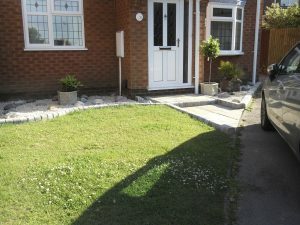 Whereas flowerbeds in an artificial lawn have to be contained in separate pots or a rockery, a natural lawn can provide a more seamless integration of plant-life. You’ll also notice more wildlife in a natural garden, with earthworms and insects making their home, which in turn will attract birds and other such visitors. When is the best time of year to lay natural turf? Natural turf can be laid at any time of the year, but for best results we recommend the autumn and winter months. This is generally from the start of September until the end of February. The reasoning is that the ground is generally moister during this time of year, your garden experiences the least footfall, and there’s less requirement to mow it. These factors all help the turf tiles to take root faster, without any stress or delay to the grass. Laying turf in the spring and summer months is still possible however, you’ll just need to water your grass regularly if the weather is warm and dry, and try to avoid the temptation to walk on your grass in the initial weeks of installing, especially when the turf is wet. How long does new turf need to take root? Depending on the time of year, it can take up to three months for turf to properly bed in. Once it’s been laid, new turf can’t be allowed to dry out before it’s put down roots, so if the weather isn’t damp, keep it moist using a hosepipe or watering can. The best time of day to water turf is either first thing in the morning or late evening, but avoid waterlogging the soil. How difficult is natural turf to maintain? Natural turf isn’t difficult to maintain, with a few key tips you can follow to help keep it looking healthy all year round. Firstly, try not to walk on the lawn if it’s waterlogged or frosted – the grass plant will be easily damaged, and excessive wear will turn over the soil into a mud-patch. Throughout the year, don’t remove worms if you find them, as worms improve soil nutrients as they pass through, and are beneficial to your lawn. Finally, keep your turf clear of leaves and debris. A pile-up of dead organic matter can trap in moisture, prevent the grass from aerating properly, and hamper the progress of those friendly worms. Therefore, be sure to rake regularly, as well as straight after mowing. Natural turf isn’t an expensive material, but costs can vary depending on whether you just buy turf tiles on their own, of if you’d like to arrange for a landscaper to professionally lay them for you. Other aspects also include the size of your garden, and any other landscaping features you may wish to incorporate too. If you’re considering artificial turf and would like more information, please contact our friendly team today for a free quote.